Justin Bieber is flat out awesome – or so he would have his Beliebers and everybody else to believe. After a pretty bad 2013 for the 19-year old, he is making it even worse for himself by bringing even worse scrutiny upon himself. Justin Bieber’s infamous “Getting better” instagram shot. how he has five number one albums, etc. He toots his own horn to the utmost and in the original version of his instagram post (which he should probably NEVER ever use), he takes a jab at Lindsay Lohan. Believe me, Lohan is a mess and a half, but he took a really cheap shot that basically equated he’s rich and she’s a loser. REAL MATURE. My thoughts? 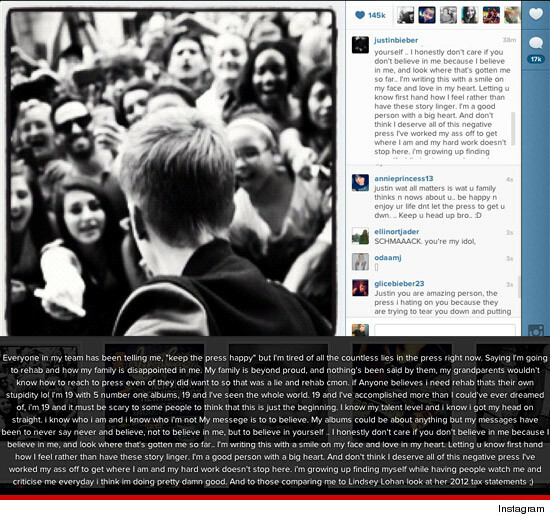 Justin Bieber’s recent immaturity epitomizes the pitfalls of money, success, and stardom. He’s let the taste of success get to his head and he now feels he’s ‘somebody’ and thinks everyone should ‘bow down’ to his greatness. You cannot justify his behavior as being 19 because he is OLD ENOUGH TO KNOW BETTER. 19 is old enough to act much more mature than Bieber is, period. Beliebers can cuss out dissenters from the order of the Bieber all they want to, but “stupid is as stupid does” and that’s how JB is acting. GROW UP. Yes I agree. Justin really had attitude problms these days. For being 19, he should be able to differentiate things, think first before he should attack others. What he did to Lindsay is so humiliating. I respect Lindsay, she is such a great actress. Now I can truly see the reason why Gomez dumped him, no wonder! I used to like him,but not now. Either u try to fix ur attitude or u will gradually lose ur beliebers. Justin, u pissed me off. U really don’t need to mention that u have five number one albums at just 19! I still love Michael Jackson tho. I think u really need a break and some space, to remind back the days, where Braun had a hard time to find ways to make u famous. Watch ur words boy when making comments. Yes undeniably u ‘rule the world’, that because u have money, but please never forget where u were belonged, where Mallette only had precious u in her life!